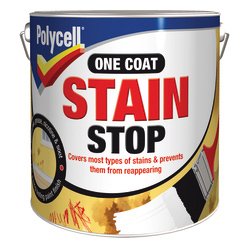 Polycell Stain Stop is a highly pigmented paint which permanently prevents stains reappearing through paint. It provides one coat coverage over water stains, grease, nicotine, crayons, rust and soot. Suitable for use on plaster, concrete, stone, masonry, plasterboard and wood. Permanently prevents existing stains reappearing through paint. One coat coverage for water stains, grease, nicotine, crayons, rust and soot. Also available in an aerosol for spray application. Use before painting or wallpapering. When painting it is advisable to wear eye protection. Cover furniture and carpets, always keep doors and windows fully open during application and drying. When stopping stains caused by water or damp, make sure that the original cause of the problem has been rectified. Apply to affected area using brush or roller. Allow 2-3 hours for surface to be touch dry, 12 hours before painting or wallpapering. 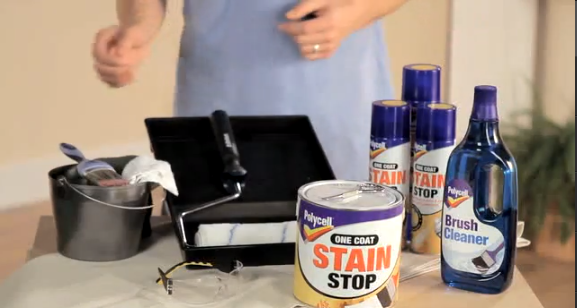 For especially stubborn stains, allow Polycell Stain Stop to dry fully, then apply a second coat. If over painting with gloss or eggshell paints, first prime treated area with water based paint. After use, replace lid firmly and clean brush or roller in Polycell Brush Cleaner.